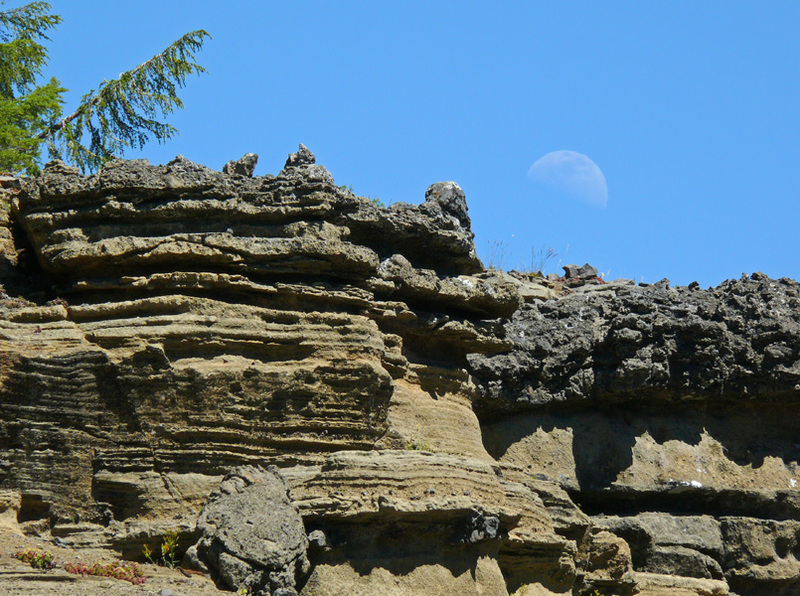 The wild rock formations at the southern end of the ridge look to me like they were underwater. Spreading phlox (Phlox diffusa) happily filled areas where their roots could find cracks. I’ve been wanting to show my husband the unusual rock formations on Balm Mountain in the Calapooyas ever since I first discovered the area. Finally on Saturday, July 5, we were able to make that happen. 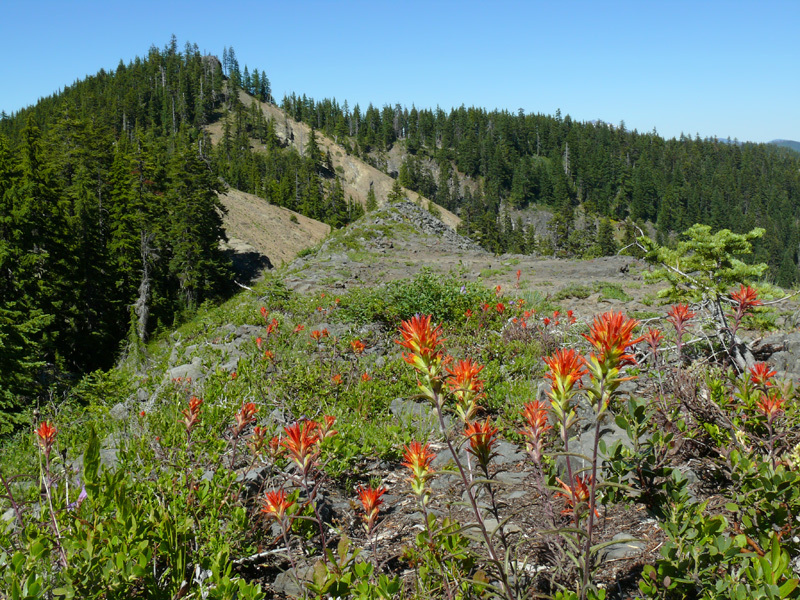 There were no great botanical discoveries or unexpected wildlife interactions, and since it’s a very busy time of year, and I’m way behind, I thought I’d just share some photos of a beautiful day on a beautiful mountain. The flowers were quite pretty, including this display of frosted paintbrush (Castilleja pruinosa). Butterflies were abundant, but the hot day meant they were flying very fast and were frustratingly hard to photograph. 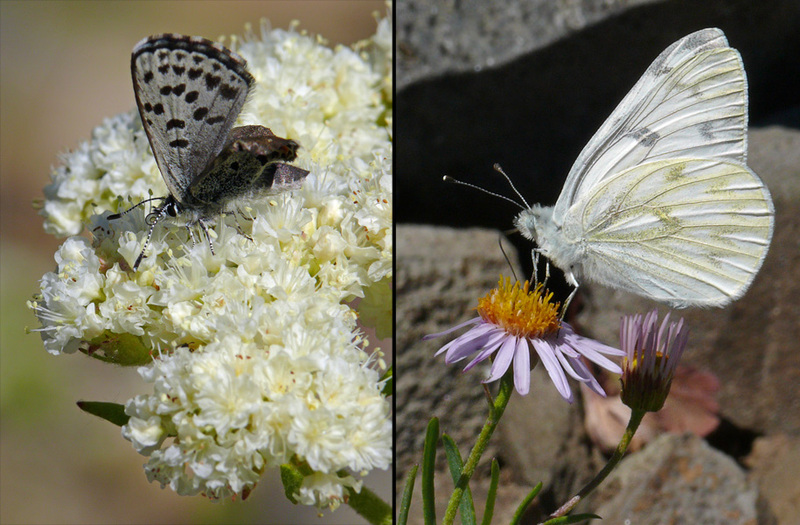 Left) this poor dotted blue had deformed hindwings, but apparently it was getting along fine and even attracted a possible mate a minute later. Right) the western whites were landing frequently on the pretty blossoms of leafy fleabane (Erigeron foliosus var. confinis) but never had much time to sip before another white would chase them away. 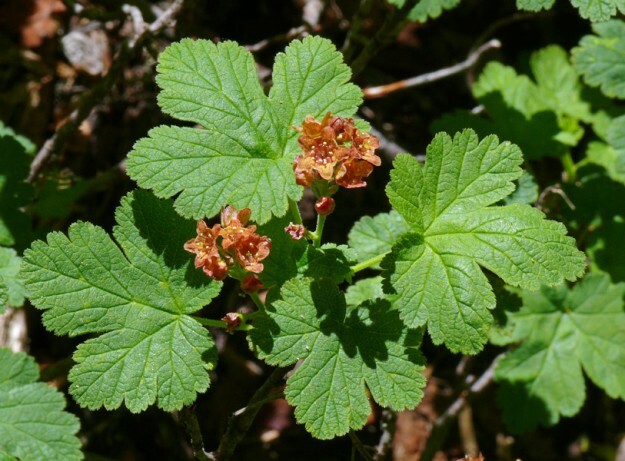 Crater Lake currant (Ribes erythrocarpum) is abundant on Balm Mountain. There were a few spots where this early bloomer’s unusual orange flowers were still fresh. 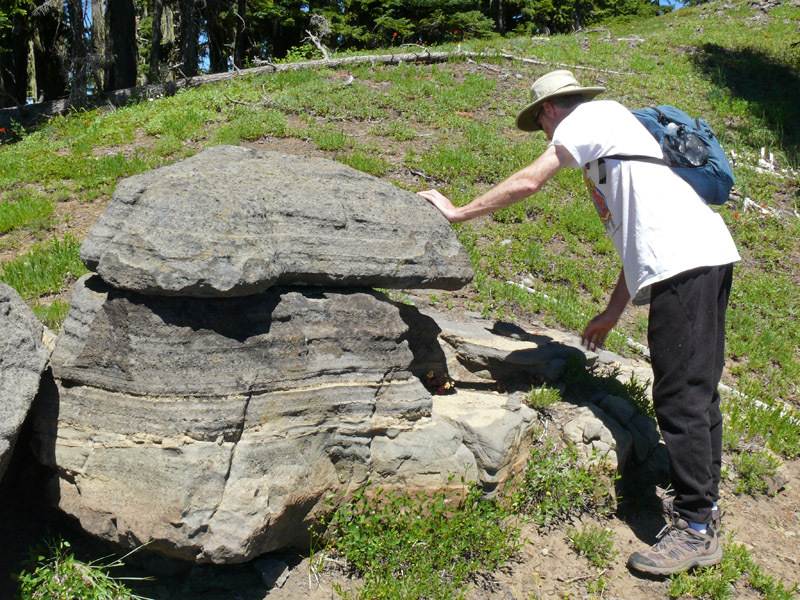 My husband Jim was intrigued by the way the rocks were eroding and undercutting layers, creating boulders on the top. 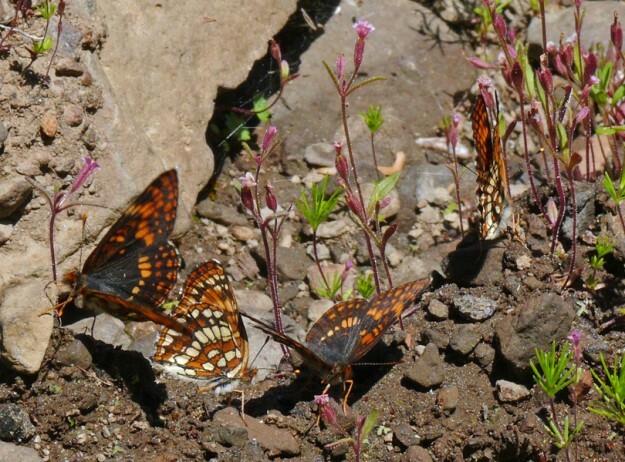 Four Hoffman’s checkerspots puddling in a seep. The tiny pink flowers are Brewer’s monkeyflower (Mimulus breweri). Thanks, Tanya, for the great pix and info. The geology of Balm Mountain looks very interesting. Perhaps its possible for molten lava to layer with succeeding flows, but do you know if Balm Mtn. was below the sea as various other Oregon mountains were? Sadly, I know next to nothing about geology. All I know is these formations on Balm Mountains are unusual for the Western Cascades. There are a few somewhat similar areas south of the North Umpqua, but they are much smaller and not as interestingly weathered. 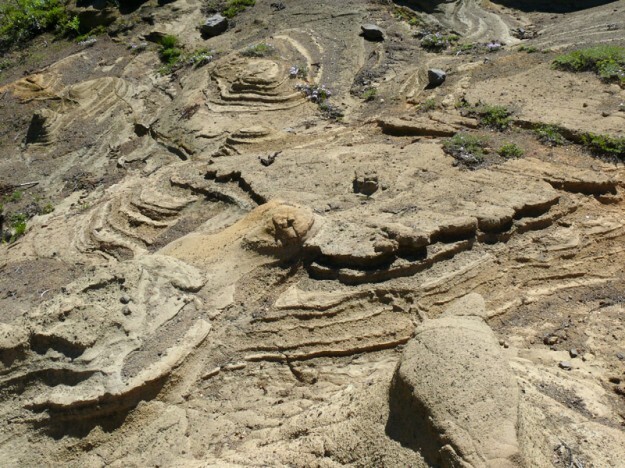 Know of a geologist who’d like to go up there with me and explain it? !